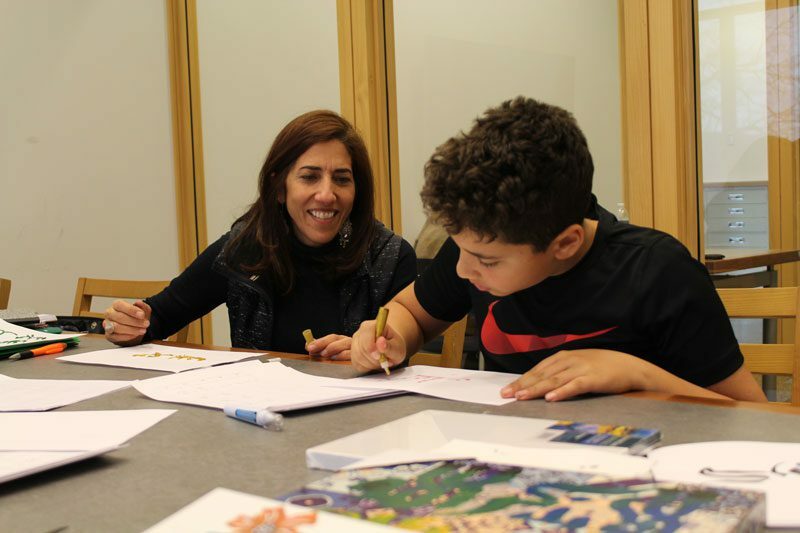 Every Saturday, a group of families gathers at the public library for Arabic Calligraphy Club. Using free meeting room space at the Main Library, they bring supplies: plain white paper, pens and markers, canvases, bottles of ink. And, of course, snacks—a tin of butter cookies, a few tomatoes, falafel, chocolate. “It’s good family time,” says Nadine Naber, who comes with her husband and two sons, ages 7 and 11. Together, they practice speaking, writing, and singing in Arabic. With some adults originally from Jordan, Palestine, and Egypt, they use different dialects but share a desire to pass on Arabic language and culture to their children. 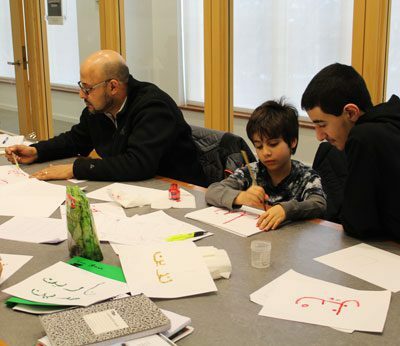 At the Main Library, members of the Arabic Calligraphy Club practice writing, speaking, and singing in Arabic on Saturdays. 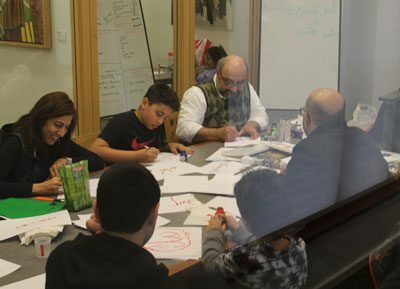 The club, which reserves space at both the Oak Park Main Library and the Brookfield Public Library, is a secular alternative to Arabic classes that take place in religious settings. “We wouldn’t be able to do it if we didn’t have the space,” Naber says, adding that the kids didn’t focus well when they tried meeting at their homes. At the library meetups, the focus is on art, fun, and personal connection. Ismail Hummos, who teaches the group with help from his 15-year-old son, says he doesn’t think language should be taught through dictionaries and books. Instead, they mix language and art, penning Sufi poems, their names, and popular sayings (“Patience is the key to success”). Naber says the club has inspired her family to draw together more at home. On Fridays before movie night, they now sit down and practice calligraphy.